The completion of the Luminous Veil in 2015 was widely celebrated as a groundbreaking landmark in the city’s history. 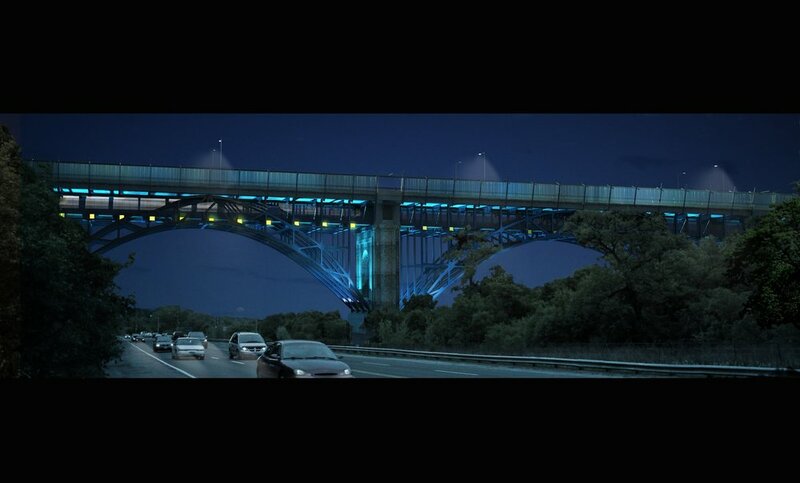 Phase III of the project, the lighting of the Underbridge, will fulfill the vision of a dynamic, luminous gateway into the city, bridging north and south, east and west. This final phase will see the installation of three new lighting arrays (The Piers, The Underdeck, and the TTC Chronometer) integrated harmoniously with the Veil. The Piers - Groups of high-powered LED floodlights will be mounted to the bottom of the TTC inspection boxes, illuminating the faces of the five concrete Piers and the abutments at both ends. These great canvases will choreograph the quiescence, surge and sway of oceanic light as it shifts in response to the conditions of the wind. The Underdeck - Arrays of LED floodlights, mounted at the level of the TTC, will illuminate the underside of the concrete decking above. These fixtures are installed high up on the inner service wall of the TTC corridor, shielding the light source from direct view. Acting as an interface layer, The Underdeck accentuates the tenuous relationship between the slow movement of the Piers below, and the trembling skin of light on the Veil above. The TTC Chronometer - An existing series of mesh-enclosed steel inspection boxes are suspended from below the supporting structure of the railway line, running east west at regular intervals between the piers. Prefabricated LED light boxes will be located at the outer faces of these enclosures. As the east or west bound trains approach the viaduct the lights are triggered in succession across the valley, announcing and celebrating the crossing. As the train departs, so this mobile rosary of light is sequentially extinguished, to be born again with each new passing.